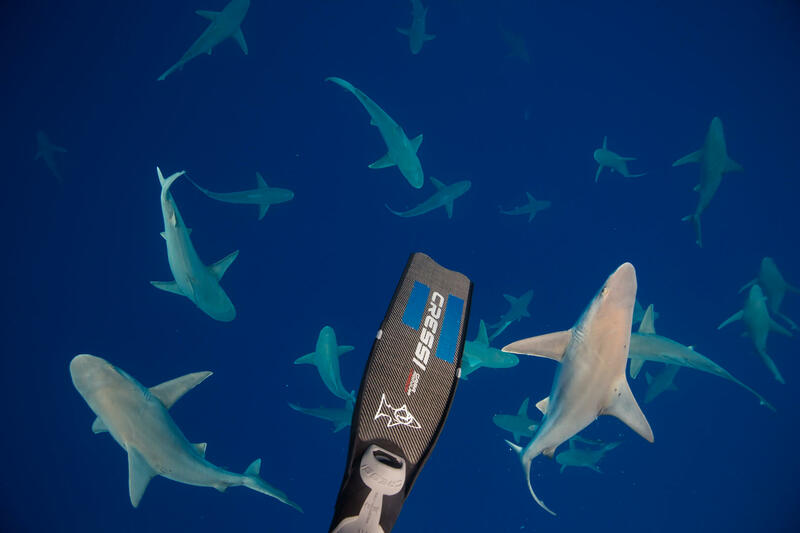 Would you swim this close to sharks? OAHU — The shark’s wide, rounded snout is pointed squarely at my face. Its 10-foot-long body presses forward until it’s about five feet away. I maintain eye contact as my trusty guide advised. Arms remain tucked in to my body so as not to look like a flailing fish. If I were photographing this powerhouse of a creature, this would be the money shot. Sans camera, it’s cemented in my brain forever. Before I could even feel panicky, its bendy body quickly reverts in the opposite direction. Thankfully, it’s not me he’s interested in but the shiny GoPro in the hands of my safety swimmer. Tracking one shark is no problem. With snorkel gear and fins on I swivel my head around to keep an eye on the nosy Galapagos shark. As a species, they are inquisitive and persistent. Right now, I’m surrounded by a dozen or so of its friends, which makes it impossible to keep track of every one. Several Galapagos and sandbar sharks are making wide circles around the boat, sometimes cruising a few feet below my fins, other times gliding by at eye level. The larger alpha sharks swim toward the top and the smaller ones at the bottom in a water column of dominance. Because our guides want the interaction to be as natural and positive as possible, there’s no chum-slinging involved and no shark cages either. That said, during the experience you might have two sharks show up or dozens. We are about three miles off of Oahu’s legendary North Shore where beyond the sharks, it’s common to find green sea turtles, spinner dolphins and the occasional whale shark patrolling the blue-green abyss. For a second, I turn to my sister. From the looks of it, she is also having the time of her life. While many travelers hop over to Hawaii for hula performances, we are here for a whole different kind of show, an underwater ballet of sorts. Far from the bustle of Waikiki, it’s perfectly peaceful. If ballet isn’t the first word that comes to your mind, I don’t blame you. These notorious sea dwellers have certainly gotten a bad rap. But we are here to prove that wrong. Just ask Ocean Ramsey, cofounder of One Ocean Diving (www.oneoceandiving.com), and all-around lover of sharks. She has dived with 32 species of sharks around the world and has devoted her life to saving them. If you haven’t heard of her, surely you’ve seen her on YouTube. She’s the brave Oahuan who fearlessly free dives with white sharks. She does it all in the name of shark conservation, research and education. When she invited me to go swimming with her toothy pals (some of which she has named Captain Pancakes, Frankenfin and Miss Aloha), I jumped at the chance. “One of the absolute best parts of the job is watching the incredible transformation that people go through from the point they step on the vessel usually terrified at the thought of what they are about to do,” she says. Afterward, the most common reaction is one of admiration and respect. “In most cases they are more afraid of you than you are of them,” says Shark Week cinematographer Joe Romeiro (Shark Week airs on Discovery through June 3). He says the main thing is to keep your wits about you, even if a tiger shark steals your camera, which has happened to him before. By the end of our excursion we had spent nearly 45 minutes in the water with 20 of these amazing predators and not a single scratch. Not even a nudge. In fact, I never once saw them flash their serrated rows of pearly whites. After toweling off and saying our goodbyes we hop on Kamehameha Highway, windows down. Papaya trees, rocky shoreline and clapboard farmhouses whiz past as we seek out a hammock. It’s one of those brilliant Hawaiian days where the breeze is just right, and we can’t wipe the goofy grins off of our faces. Hours later, the excitement is still fresh. We gab about it to anyone who will listen. From the college student serving up our lunchtime veggie burgers to the helicopter pilot who shows us the jagged Ko‘olau Mountains. As the sun drops below the surreal landscape, I spot a shark from the chopper. It’s just a speck from this point of view, but I’m still in awe of this incredible (and misunderstood) species. Weeks later, I still go on and on about it to anyone who will listen. TRIP DETAILS: $150 gets you in the water with the sharks and marine biologist/divemaster. Bring your GoPro, or have One Ocean film it for you for an extra $50. If you’re not quite ready to jump into the water, it is $80 to go out on the boat and learn and observe from the surface.